The Strength Within: Kelly Breeyear Helps Fellow Moms Fight Addiction | Features | Kids VT - small people, big ideas! Mothers of young children often gather in groups: to seek advice, to offer support, to commiserate. Four moms sitting in a circle of chairs in a large room in downtown Burlington are doing all three. They speak in the familiar banter of women who don't just know each other, but get each other. A woman wearing jeans and a T-shirt — whose 9-month-old daughter lies on a crocheted blanket, banging two oversized Legos together — announces, with chagrin, that her husband is planning to paint their bathroom purple. "Lavender or Barney purple?" another mom asks. "Barney purple," the woman confirms. "That's just wrong," responds another. A collective laugh confirms they're all in agreement — it's a bad decision. Their taste in decorating isn't the only thing these women have in common. They are all in recovery from alcohol or drug addiction, and requested to be quoted here anonymously. They've gathered for a meeting of the New Moms in Recovery Program at the Turning Point Center of Chittenden County in Burlington. The year-old group helps new and expecting moms stay sober. The need is dire. The number of moms addicted to drugs has increased dramatically over the last two decades, driven largely by the opioid crisis. Nationally, rates of opioid use disorder among women giving birth quadrupled between 1999 and 2014. In Vermont, the number of infants exposed to opioids in utero in 2013 — 33.3 per 1,000 births — was almost 48 times higher than it was in 2001. This trend has serious consequences for kids as well as moms. In addition to withdrawal, the National Institute on Drug Abuse reports that infants exposed to opioids during gestation can be preterm and have low birth weight, reduced cognitive ability, and physical and behavioral deficits. Of the approximately 500 children under age 6 currently in the custody of the Vermont Department for Children and Families (DCF), more than 60 percent are there due to parents' substance abuse issues. Vermont has made progress through initiatives like the Children and Recovering Mothers, or CHARM, Collaborative, a 16-year-old program which brings together physicians, social workers, state officials and healthcare professionals to help pregnant women with opioid use disorder access treatment. Turning Point's new moms' group takes the effort a step further, helping moms to sustain their recovery. The program provides a safe, judgment-free space where women can be open and honest about their struggles. At its helm is Kelly Breeyear, a 38-year-old mother of two. Like nearly all of the employees of Turning Point, Breeyear is in recovery herself. If a client grieves the loss of a parent, Breeyear can understand. Death of a partner or separation from a child? Yes, she shares those experiences, too. Her addiction story stretches back nearly 20 years and contains its own setbacks and second chances. "Sometimes it feels like I'm getting paid to work on my recovery," she says. Parenting while in recovery "can get very overwhelming," Breeyear says. "It's definitely taken down a lot of women who are doing their best and not getting enough support and can't cope well with that stress in a realistic way." Women like Madelyn Linsenmeir: The 30-year-old Burlington mom died in October after years of drug addiction, leaving behind her 4-year-old son, Ayden. She had been a regular at the Turning Point Center, though not in the moms group. In a candid obituary, her sister Kate O'Neill wrote movingly about Linsenmeir's struggle to maintain recovery from opioid addiction. "After having Ayden, Maddie tried harder and more relentlessly to stay sober than we have ever seen anyone try at anything," the obituary read. "But she relapsed and ultimately lost custody of her son, a loss that was unbearable." The obituary struck a chord and was shared by people around the globe, as well as media outlets and celebrities, including Alyssa Milano and Ivanka Trump. Breeyear is committed to helping other Vermont moms avoid a similar fate. Turning Point executive director Gary De Carolis describes her as "a great listener, very enthusiastic and upbeat." But she doesn't shy away from tough topics. The conversation that November day pivots from paint colors to the looming holiday season. Holidays can be an especially perilous time for those in recovery. Breeyear — a petite woman with delicate features and a dark, wavy bob she likens to Betty Boop's — invites the moms to share what's worrying them. They talk about the difficulty of attending gatherings where family members aren't sober, of the pressure to be happy during this time of year, of not getting to spend Thanksgiving or Christmas with their children. The mom of the 9-month-old relates that, two years ago, her own father died right before Thanksgiving. Her mom didn't invite her to the funeral. The woman showed up anyway and her mom called the police, who asked her to leave the church. That drove her to drink. Later, she speaks about her almost-4-year-old son, who is no longer in her custody. Recently, she tells the group, she came across a picture of him on Facebook. Fighting back tears, she says he had a different haircut than she remembered. He didn't look like himself. It's important to work toward "progress, not perfection," Breeyear reminds the women. "We're doing the best we can. It's exhausting, but we're choosing to do it." Like so many stories of opioid addiction, Breeyear's begins with prescription drugs. When she was a senior at Winooski High School, she tore her anterior cruciate ligament during basketball practice and needed surgery. She was given Percocet for pain, but it made her sick, so her doctor prescribed codeine. Though her mom made sure she didn't take the medication longer than needed, Breeyear thinks that codeine was the spark to what would become, more than a decade later, full-blown addiction. It was "just a little click," she remembers. "Like, this works, and it feels good." Breeyear graduated from high school, worked as a nursing assistant for two years, then attended Vermont Technical College and fulfilled a childhood goal of becoming a registered nurse. She worked with patients with Alzheimer's disease and dementia, eventually moving to the Boston area with her high school boyfriend. But she was dogged by chronic back pain due to scoliosis and degenerative joint disease. She tried managing it with physical therapy, chiropractic treatment and massage, but eventually, prescription painkillers were the only thing that seemed to work. "Then life struck," she recalls. Breeyear's mother, then living in South Carolina, was diagnosed with cancer, and Breeyear moved there to care for her. Breyeear's stress level spiked, she says, leading to intense physical pain. Her terminally ill mom had copious amounts of opioids in the house, which Breeyear used to self-medicate. After three months, with her mom's treatment going well, Breeyear returned to Boston, where she resumed nursing and began taking drugs from work to support her habit. Her mom told her that her one regret if she died would be never getting to meet her grandchildren. So Breeyear got pregnant. She continued to use prescribed opioids during pregnancy. Both Breeyear and her mother had moved back to Vermont by the time Breeyear's son, Jack, was born in 2008. Breeyear's mom got to spend three months with her first grandchild before she passed away. The stress of her mom's death, caring for a baby, and working opposite shifts from her boyfriend to avoid childcare costs exacerbated her addiction. Breeyear began using opioids not just to manage her pain, but to cope. Her relationship with her boyfriend dissolved before their son turned 1. When Jack was 14 months old, Breeyear had a seizure at work — which she believes was brought on by taking too much of the pain medicine Tramadol — and fell, suffering a traumatic brain injury. That setback spiraled into more prescriptions and an extended recuperation period. During that time, she began seeing a counselor for the first time in her life and realized she was misusing painkillers. She started working with her doctor to taper off medications. And then, at a wedding, she met Shawn Carter. Breeyear and Carter bonded quickly over their shared pain. Carter had a history of drug and alcohol addiction, and his mother had died of a drug overdose when he was 5. The two moved in together seven months after they met; Breeyear shared custody of Jack with his father. With Carter, Breeyear started drinking heavily. She went to work at a nursing home and began diverting drugs at work again. Her brain injury made it difficult for her to work efficiently; she sometimes had to leave the nursing home to pick up her son from his childcare center, then bring him back so she could finish her paperwork. She stopped seeing her neurologist because, by then, she had a documented history of drug use, and she knew she wouldn't be able to get a prescription for pain medication. That led her to buy drugs, including OxyContin, off the street for the first time. Six months into her new job, Breeyear mistakenly gave a patient a double dose of medication and was fired. Around this time, she became pregnant. She used the opioid Opana and smoked cigarettes throughout her pregnancy. She gained just 12 pounds, had two episodes of false labor and developed gestational diabetes during her pregnancy. "I wasn't able to make the healthy choices I wanted to, which should have been a big red flag," Breeyear recalls. She believes her obstetrician had suspicions about drug use, but never asked about it. If the doctor had voiced her concerns, Breeyear says, she believes she would have been more likely to seek treatment sooner. Instead, her drug use was exposed when her daughter, Marlee, was born a week and a half early — in an ambulance on the way to the hospital during Hurricane Irene in 2011. The newborn was rigid, and had tremors and a shrill cry, some of the telltale signs that she had opioids in her system. At the University of Vermont Medical Center, doctors immediately began collecting the baby's urine. As a nurse, Breeyear knew what that meant: It would be tested for drugs. Their release from the hospital was delayed and Breeyear got a call from the pediatrician, coincidentally her own childhood doctor, saying there were concerns that her baby had been exposed to drugs. Breeyear was struck by the doctor's caring and compassionate manner and worried about Marlee's health. Babies born with opioids in their system sometimes experience withdrawal symptoms that require special medical attention. She admitted to using drugs during her pregnancy, and DCF was called. A caseworker came to the hospital to interview Breeyear and Carter. Breeyear downplayed the frequency of her drug use, and the couple was allowed to leave the hospital with Marlee. For several months, the Visiting Nurse Association and DCF visited to assess Marlee's health and the home environment. Even though Breeyear continued to abuse drugs, she was able to allay the caseworker's concerns, and DCF closed its investigation. If she had been subject to a urine test, Breeyear says, it would have been clear she was continuing to use drugs. In hindsight, she wishes she'd been tested, and believes health professionals and social workers need better training when it comes to assessing parents. In the months after Marlee was born, both Breeyear and Carter made attempts to detox on their own, but each time they relapsed. Though Breeyear was on unemployment, the couple wasn't able to keep up with their bills. They were evicted from their apartment and floated around to relatives' and friends' homes. Breeyear started snorting heroin, and Carter began selling it to support their habit. "Heroin was always my 'would never touch' drug, so immediately there was the guilt and shame of even having tried it," Breeyear explains. Her addiction was immediate. On New Year's Eve of 2012, the police were called to a friend's home, where Breeyear and Carter were staying, to investigate an assault. Breeyear was highly intoxicated and DCF opened another investigation. Eventually, Breeyear and Carter began living in hotel rooms through the Champlain Valley Office of Economic Opportunity's home assistance program. Jack, then 5, went to live with his father. In the early spring of 2013, the family of three found a slightly more permanent place to stay. Carter's uncle, Paul Somerville, and his wife, Lori, took Breeyear, Carter and Marlee into the basement of their Colchester home. Somerville, a pastor at Cornerstone Community Church in Milton, had been in recovery from drug and alcohol addiction for 25 years. His parents were recovering alcoholics and his sister — Carter's mother — died of a drug overdose on Somerville's 17th birthday. Though Breeyear might not have known it, Somerville says he was aware the couple were abusing drugs when they moved in. "Kelly tried to pretty up her addiction for me," Somerville explains. As Carter's addiction worsened and he began stealing things from the house, Breeyear "had to be the functional one." Though Somerville was concerned for Marlee and his own teenage kids living at home, he showed compassion for the couple, inviting them to dinner and praying with them before meals. "I treated them like suffering addicts," Somerville says. "I didn't treat them like they were criminals. I didn't treat them like they were on the fringe." He tried to reinforce the idea that Breeyear, Carter and Marlee were a family unit. "We wanted her to understand that we saw her as Marlee's mom — she was a real person, a mom, Kelly. She wasn't an addiction with a child," continues Somerville. Breeyear describes walking up the basement stairs hand-in-hand with Carter after they decided, once again, that they would try to get off drugs on their own. The Somervilles agreed to take care of Marlee while Carter and Breeyear detoxed in their home. But, in the absence of medical help, their efforts failed. Breeyear's drug use escalated; she began injecting heroin intravenously. Things went downhill quickly. The couple began stealing together to support their habit. In June 2013, after months of dodging DCF, Breeyear called them back. "I don't remember what it was that made me finally call," she says. But DCF asked her to come in for an assessment with a caseworker, which she did. "I just spilled my guts," she remembers. Along with Carter and the Somervilles, the caseworker helped Breeyear make a treatment plan. She detoxed at Act 1 in Burlington, then went to rehab at the now-closed residential Maple Leaf Treatment Center. She celebrated Marlee's second birthday there, with a cake on a picnic table. "That could be seen as sad," says Breeyear. "It's definitely not ideal, but, you know, it's a healthy choice." Despite his family's urging, Carter refused to go to rehab until Breeyear was finished with her stint at Maple Leaf; he felt that Marlee should have one parent living with her. Though it might be difficult to understand why an addicted parent would feel that being with his or her child is more important than receiving help, Breeyear says that's a common mindset. Despite their addiction, she explains, she and Carter were "still parents and loving our kids ... people don't get that we're not choosing [drugs] over our kids. That is not what happens. It's so hard to leave them to get well to be a good parent." DCF Deputy Commissioner Karen Shea underscores that point. She often hears about parents who find it difficult to take time off from parenting to take care of their own needs. Feelings of shame and stigma, or fear of losing their children if they admit they need help, are also common. In Vermont, she says, "we don't have a lot of treatment options built to support women who are wanting to seek treatment while also actively parenting." One program that allows that to happen is run by the social services organization Lund. After Maple Leaf, Breeyear entered Lund's residential program, which provides substance abuse and mental health treatment to pregnant women and moms of children under age 5. Kids are allowed to live in the South Burlington facility and attend daycare while their moms receive treatment. According to Lund's case management and community clinical services coordinator, Amy Woodruff, women in the program are assigned a case manager, a family educator to help with parenting skills, a medical support worker, a counselor and, in some cases, an academic advisor or family engagement specialist to help set up visits with older children or partners. There is no set time frame for how long women stay in the program. Rather, they set goals and leave Lund when they've met them. Woodruff first met Breeyear in 2013, when DCF was helping her make a plan, and remembers her as both motivated and sad. Breeyear wanted whatever help she could get, Woodruff recalls. Breeyear spent seven months at Lund with Marlee. At first, she felt superior to the other women there because she was older than many of them and had already established a career. "It took me a while to realize that I had a bed there, too," she says. "I was there for a reason, too." Breeyear says she had her "eye on the prize" during her stay at Lund; she completed her treatment there in seven months. She left in April of 2014 with a plan to renew her nursing license and return to professional work. But she had difficulty coping. "I didn't understand that even though I had participated in all these programs, I hadn't really done any of the work," she recalls. She had just been going through the motions. "I got all the information like a sponge in case I needed to pull it out to use it, but I hadn't really practiced any of it," she explains. "I didn't realize how much my addiction had changed me and my thinking. Every time anything came up when I was stressed out, I was immediately thinking about drugs." Woodruff says it's common for those who leave Lund to struggle, especially due to isolation and loneliness. In the absence of the supports that the residential program provides, women sometimes don't know how to reduce their emotional distress without using drugs, she explains. While at Lund, Breeyear had broken off her relationship with Carter, who had not been able to kick his addiction. She got a job at Goodwill in South Burlington and took two buses each morning from her apartment in Winooski to get Marlee to childcare at Lund. She then walked to her job at Goodwill, worked a full day, picked up Marlee and took two buses home. Around eight months after leaving Lund, despite fighting the urge to use drugs every day, she says, Breeyear relapsed. Several weeks later, she called Lund, and within a month, she was back in the residential program. "I just sat there in bed looking at the bare walls, thinking, How the hell did this happen? How did you end up back here?" Breeyear says. Though she was ashamed, the staff at Lund told her what she could not see herself: She was strong and brave to come back. Breeyear spent another 11 months there. This time, she dug in, working to change her thought patterns and employing cognitive behavioral therapy to better understand her codependent relationship with Carter. When she left Lund the second time, she was better equipped to deal with her life. She received a medical deferment from work so that she could focus on her recovery, accessing benefits through the state's Reach Up program and 3SquaresVT. She worked regularly with her clinicians from Lund and enrolled in Howard Center's Parent Child Interaction Therapy program to learn positive strategies for communication and discipline. Carter wasn't as fortunate. Just shy of a year after Breeyear left Lund for the second time, she got a call from her son's father telling her Carter had died of a drug overdose. Breeyear was driving with Marlee in the back seat when she found out. She began crying and repeating out loud, "How am I going to tell her?" When Marlee asked what had happened, Breeyear said it didn't concern anyone she knew. A few days later, Breeyear and Carter's family sat across from then-5-year-old Marlee and told her that her father was gone. Marlee's first reaction was anger that her mom had lied to her. "I said, 'You're right, and I'm sorry,'" Breeyear recalls. "These conversations — where do we get the strength for that?" 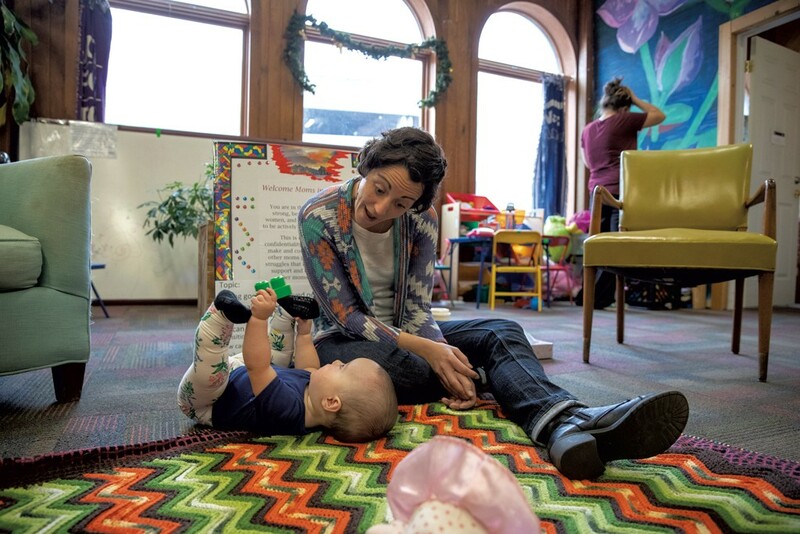 Last spring, a clinician at Lund told Breeyear that Turning Point was going to start a group focused on moms in recovery, with help from the Vermont Department of Health. Breeyear went to Turning Point and introduced herself to director Gary De Carolis. She started volunteering at the center and, after about six months, was tapped to run the group. Because of her temperament and first-hand experience, De Carolis calls her "a perfect match" for the job. Participation in the group has grown steadily. In November 2017, its first month, 28 women came to meetings. 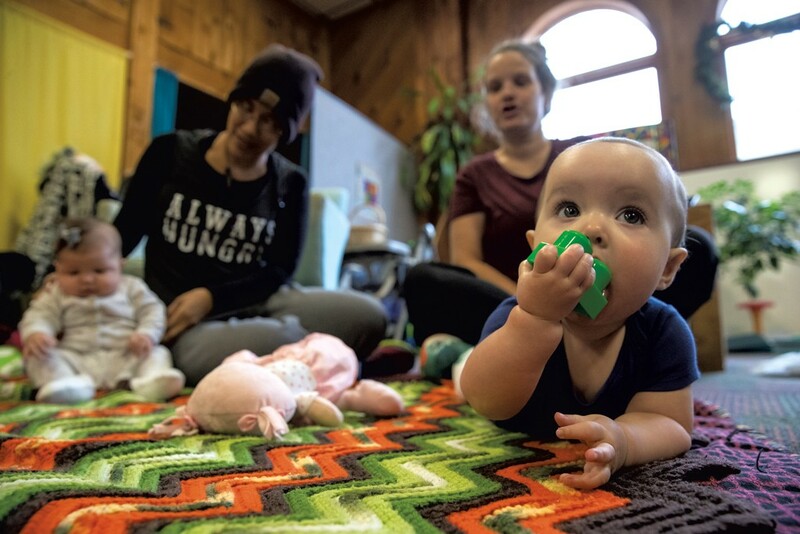 From July to September of this year, a monthly average of 46 women attended — along with numerous infants, toddlers and older children. The group meets three times a week. Participants can come for an entire session or drop in for part of it. In addition to working through personal issues, women share hand-me-down baby clothes and help each other adjust car seat straps. A variety of toys entertain the kids while the moms talk. During Saturday groups, the center serves donated pizza and Breeyear brings Marlee, 7, and Jack, 10. Though Jack lives primarily with his father, Breeyear now sees him on weekends and school vacations. One mom, who has been coming to the group regularly since April, says she's gotten attached to the other women who attend. "It feels like home to me," she says. Breeyear is down-to-earth, she continues, and, because of her background as a nurse, she's able to give good advice. At the end of November, Turning Point moved to a bigger space, a red brick building on the corner of King and South Winooski streets. There's a large room designated for the moms and young kids who come to the center — it will be dedicated to Maddie Linsenmeir. Her widely read obituary asked for donations to Turning Point, and 330 of them rolled in, totaling $18,000. The room itself is a testament to growing awareness of the need to support moms in their recovery. Breeyear's office is next door, with a window that looks into the room. She's excited to grow the moms program in the new space, and says she's there to support the women she works with in anything that happens, unconditionally. Helping others navigate the same issues she's experiencing is one reason Breeyear thinks she's been successful. Addiction isn't win or lose. It's a constant battle, she says. "There are days that are really hard, when my brain is saying, You can turn this off right now and it wouldn't be difficult," she continues. "Some days are easier than others." Yoga, meditation and vitamin supplements are tools she's found to help manage her physical pain. She has reconnected with her spirituality, as well, and attends church regularly. Cognitive behavioral therapy has given her a better understanding of her thoughts, feelings and behaviors. Somerville says he's seen a change in Breeyear from the inside out. In recovery, he explains, you reach a point where "you stop running away from something, and you start to run toward something. Really early in her recovery, she started walking out of the woods." "What Kelly did," he continues, "is made the decision that she was going to put her pain to work." Lest she forget where she has been and what she is capable of, Breeyear had a tattoo inked on the inside of her slender forearm two years ago. It's a semicolon — a recovery community symbol that signifies that the story could have ended, but it continues. Then, these words: "The strength within me is greater than any fears." If you or someone you love need to access treatment or recovery services, visit the Turning Point Center of Chittenden County website at turningpointcentervt.org, or call 861-3150. 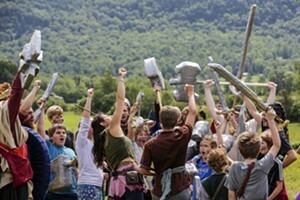 For more information about other peer-run recovery centers in Vermont, visit vtrecoverynetwork.org.